Beaujolais Nouveau - Thursday, Nov. 17th! Bastille will be pouring 2016 Domaine Vissoux and Domaine Dupeuble Beaujolais Nouveau from Magnums on Thursday, November 19 starting at 5pm for $4/taste, $8/glass, and $24/carafe. Wine director James Lechner selected these two outstanding Beaujolais Nouveau producers to showcase the vibrancy of the Gamay grape. He has also selected additional wines from the Beaujolais region—older wines that provide an interesting contrast and demonstrate the variety of styles the region produces. Additional Beaujolais wines from the Gang of Four, a group of outstanding natural wine producers in Beaujolais, will be available by the taste, glass and bottle. Natural winemaking is an Old World technique of reducing winemaker intervention in the winery. The process results in especially vibrant, fresh exemplars of the Gamay grape. 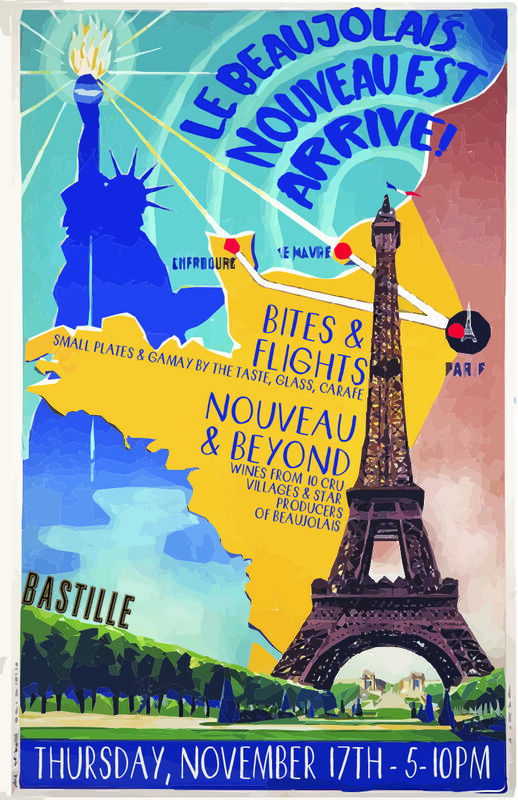 Bastille will also showcase wines from producers of Cru Beaujolais, which come from the ten best villages of the area, and are well structured and full of minerality. Next to the light, fruity and young Beaujolais Nouveau these wines display the depth this southern French appellation is capable of. The Bastille team will be pouring 2.5oz tastes, 5oz glasses, 500ml carafes, and bottles from producers such as Jean Foillard, Marcel Lapierre, Jean-Paul Thévenet, Domaine Diochon, Domaine Vissoux, Chignard, Guy Breton, Chemerin and more. This broad selection will give guests a chance to compare villages, vineyards, vintners, and vintages.